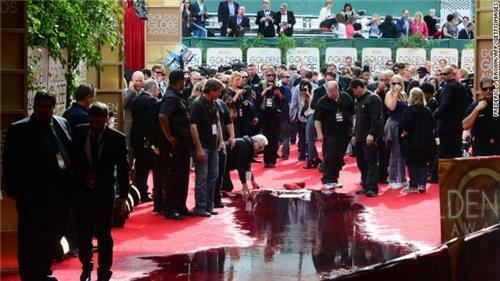 Welcome to CNN’s coverage of the 2014 Golden Globe Awards. Follow us for everything from red carpet arrivals through the entire ceremony. Be a part of the conversation by leaving comments and engaging in discussions on all things Golden Globes. The #GoldenGlobes needs to stop with the music cutting off the winners. Amy Adams -- more like Amy Adorable! "I'm as nervous as everybody else!" -Jon Voight -- a showbiz veteran over a half-century -- accepting the award for Supporting Actor in a TV series/miniseries/movie for "Ray Donovan." 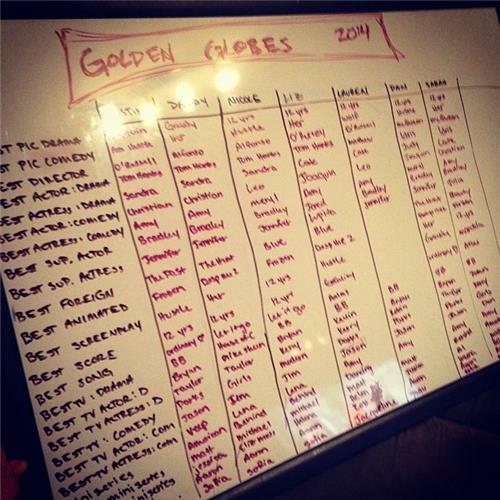 We are more than an hour in to #GoldenGlobes Thoughts so far? 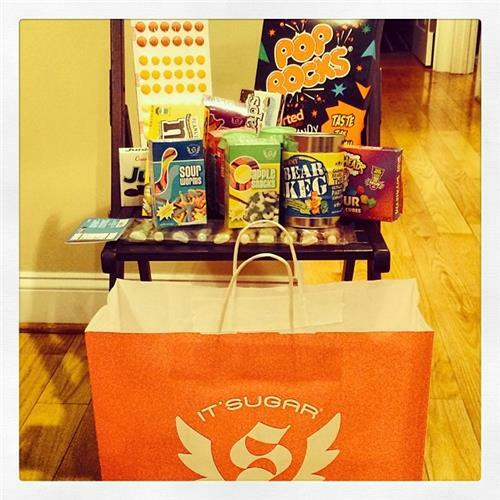 Thanks for the #Sugar @kjsperber ???????????????????? #GoldenGlobes #watchparty w/ @cdubbers13 #filmnerd ???? "This really is personal for us. Very, very personal." -Bono, accepting the Original Song, Motion Picture award for "Ordinary Love" from "Mandela: Long Walk to Freedom." If U2 was going to burst into song right now, which of their songs would you most like to hear? I'm pretty sure everyone at the Globes is drunk, Camera crew, telepromter people, Jacqueline Bissett, Paula Patton's bow. Just everyone. #GoldenGlobes Jacqueline Bissett disastrous speech set the stage for the night. No Mas, Trying to decide on "Girls" or "Dowton Abbey"
8:12: everything moving flawlessly. 8:13: Bissett wins. 8:45: Gets to podium. 8:46: Refuses to leave. 8:49: Still hasn't said anything. Between the rambling, awkward pauses and, erm, interesting choices of language, #Bisset quickly became fodder for jokes on Twitter. What'd you think of her acceptance speech? Hands down, the first memorable moment of the night, right? You can see more Twitter hilarity in the slideshow up above. 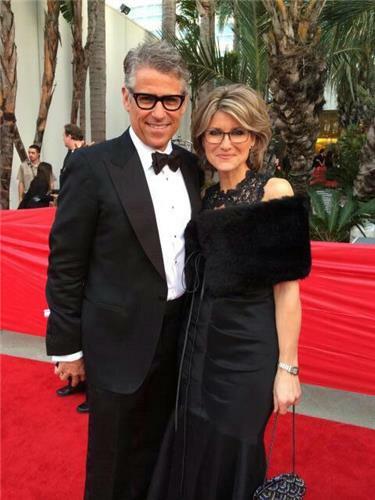 “@NewDay : Take a look at 1 of our own on the red carpet! RT: “@CNNAshleigh : At the #GoldenGlobes ! Sooo fun! http://pbs.twimg.com/media/Bd0ojcwCUAAdlzS.jpg”” GORG! It has been a long time coming for her. love, love LOVE Tina's dress and hair, and her all around look!!!!!!!!!!!!! "I hope to one day be one-tenth the woman you are" -Elisabeth Moss to her mother during her acceptance speech as Best actress in a TV miniseries/movie for "Top of the Lake"
JLaw is always so cute. "Don't ever do this again. It's so scary" she says in her #GoldenGlobes speech. Jacqueline Bisset is very emotional with her first #GoldenGlobes "I can't believe this." She asks to see Chiwetel Ejiofor for inspiration. Personally, I would love to have seen Monica Potter win for "Parenthood" -- wonderful, underrated show with superb acting. What did you think of the opening act? 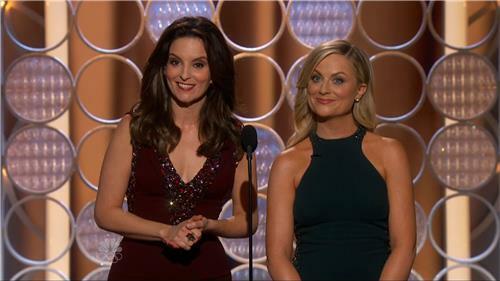 Are Tina and Amy #winning or #failing? #GoldenGlobes TV supporting actress award goes to Jacqueline Bisset who seem like she can barely get up she's so stunned. Two funny ladies, one big night. So who is getting more conversation on Facebook? 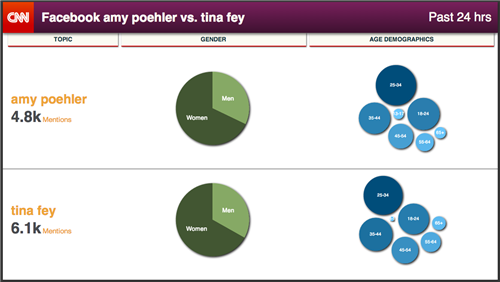 Over the 24 hours leading up to the Golden Globes, looks like more people are mentioning Tina Fey on Facebook. We'll see how that changes throughout the night.